It’s done! Are you ready for the final reveal? 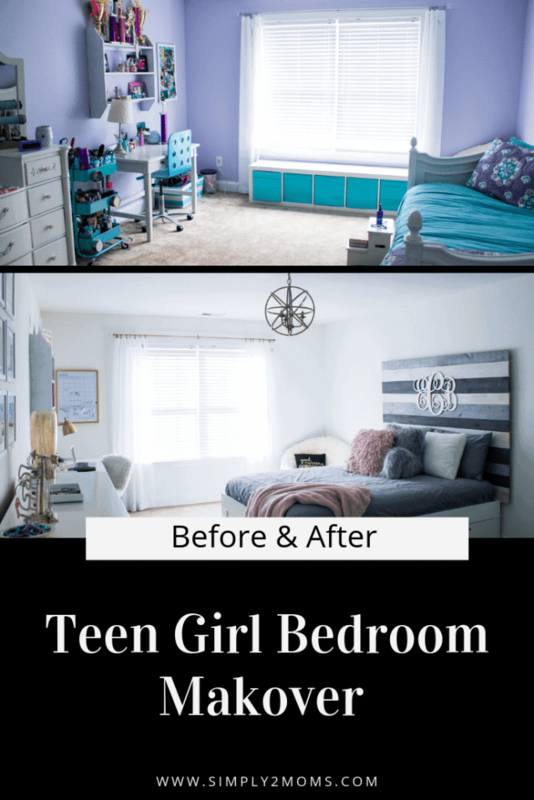 Today I’m sharing all the before and after pictures of our daughter’s teen girl bedroom makeover. 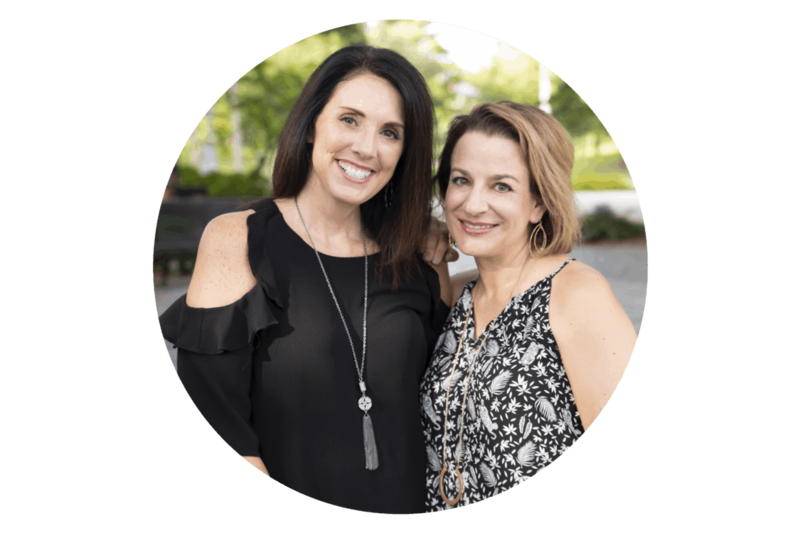 If you haven’t been following along…no worries… I’ve included the links here to the projects we completed. This bedroom update was my daughter’s 13th birthday present. We won’t mention the fact that she is almost 15 now. Oops…guess it took us a while for the final reveal! She did get her new furniture and bedding for her 13th birthday. And I also painted her room the week after her birthday. But let’s just say everything else was a process…a very long process. Haha! I bet you can guess that her favorite color was purple…but she also liked turquoise…so we incorporated both colors into her bedroom design. The walls were Lavender Mist by Benjamin Moore. We added turquoise in her accessories. And the quilt from PB Teen meshed both colors together. But as she got older her taste changed and she wanted a more mature looking bedroom. And because I love to redecorate my kid’s rooms I was happy to give her an update. What she really wanted was a new bed. Insert sad face because I just loved her daybed. It made me sad to replace it but she wanted something simple. We decided to upgrade her from a twin to a queen sized bed because she was starting to have friends stay over more often. What’s more fun than a sleepover with your bestie? Life is all about compromises right?! 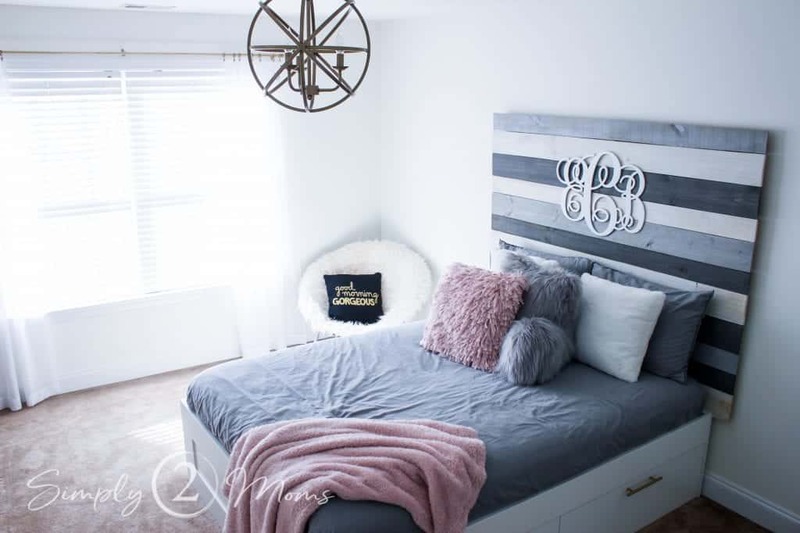 Well…we compromised…she got her simple Ikea bed base but I built her an amazing farmhouse style pallet headboard. 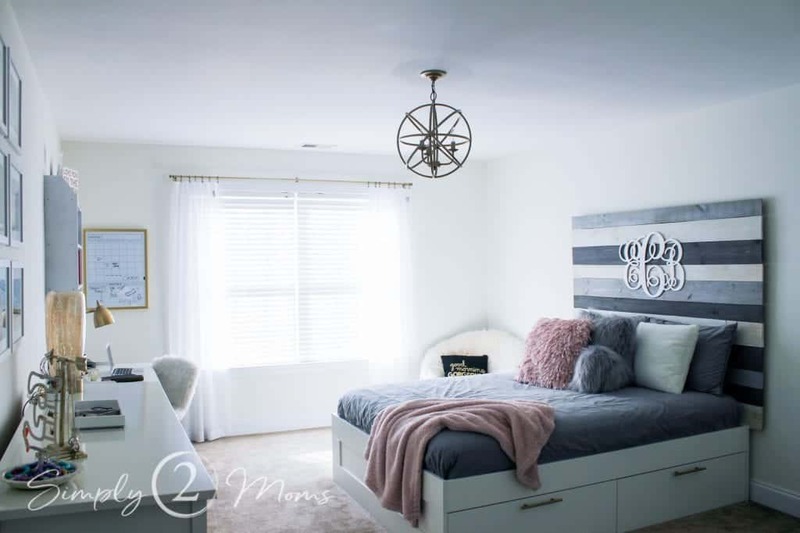 After so many bright colors in her previous bedroom decor, she was craving simplicity and wanted a white bedroom. 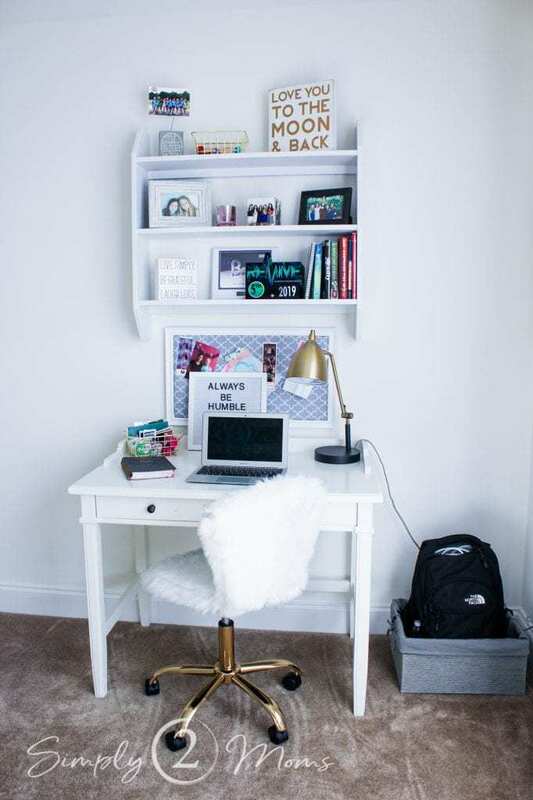 We painted the walls Cloud White by Benjamin Moore and she also chose white furniture. But we added gray, blush pink and gold as her accent colors. Even with those colors, the room still feels light & bright. When we were deciding on bedding we thought it would be best to go with gray. 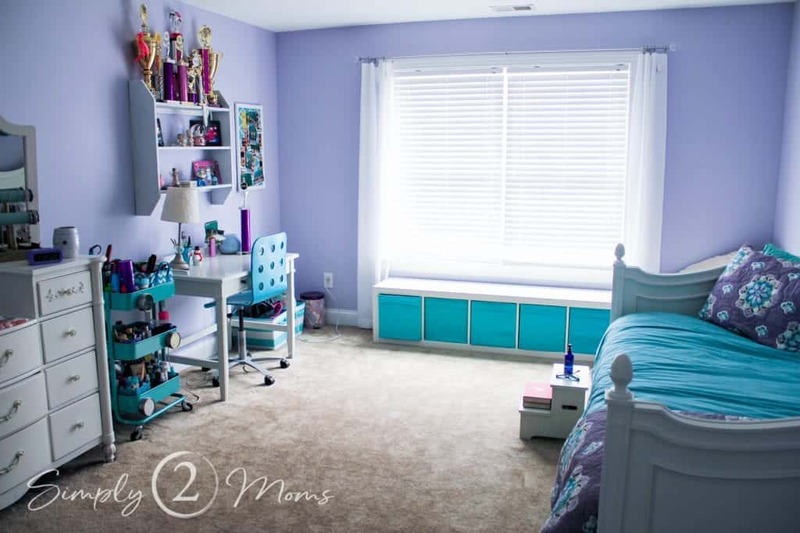 Teens are messy, especially my kid…all that makeup…remember the vanity area I shared? Fuzzy plush pillows and lounge-a-round make the bed super comfy for binging Netflix shows. 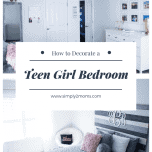 Teens spend A LOT of time in their bedroom so why not make them comfortable. We found the monogram on Etsy and painted it white. 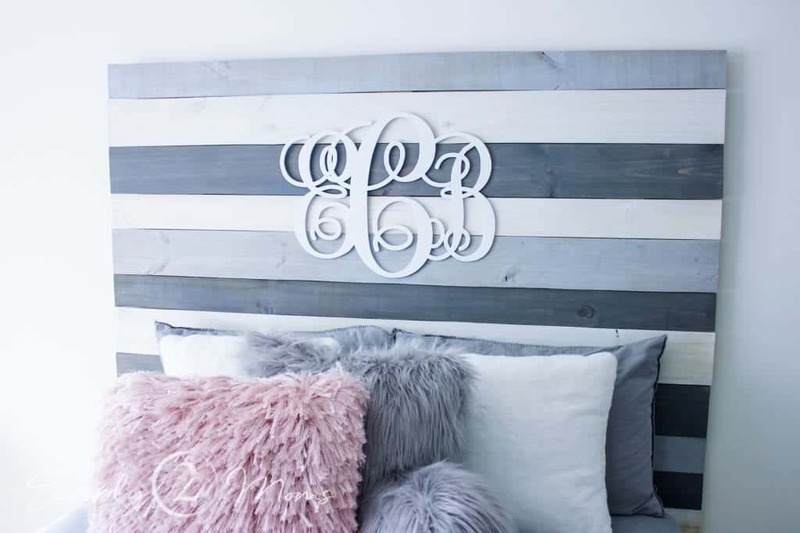 It’s the perfect accent piece against the gray tones in the pallet headboard. The white fuzzy hang-a-round chair is also from PB Teen that she got as a Christmas gift. 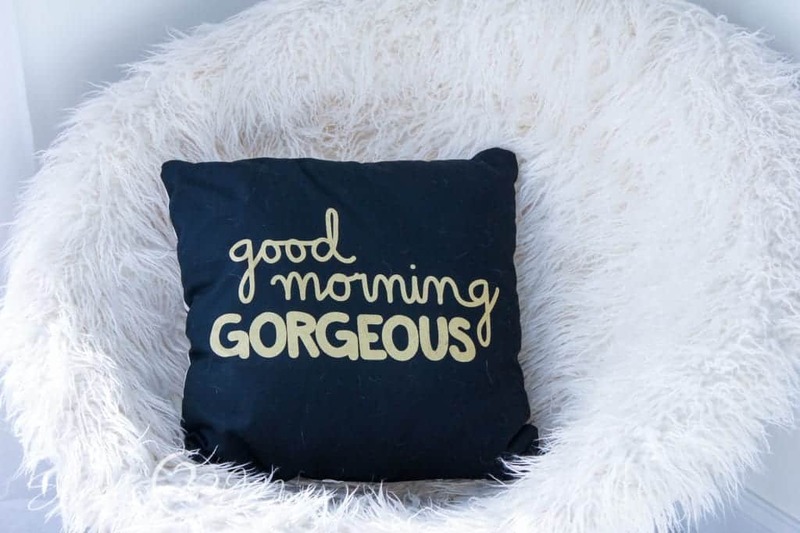 I found that cute pillow on clearance at HomeGoods and thought it was perfect since one of her accent colors is gold. Those double windows bring in so much natural light. We saved some money by using the curtains she had. They are a semi-sheer with a trellis pattern that frames the windows beautifully. Reusing the curtain rod and rings…just updated with paint…saved us even more cash. Here’s another view of the updated bedroom with her new dresser from Ikea. Although I loved her old dresser, the drawers were so tiny they didn’t store much. And as you can see her closet is pretty small as well. But now between this dresser and her storage drawers in her new bed, she has plenty of room for clothing. You can also see 3 of our projects that we did in that picture. 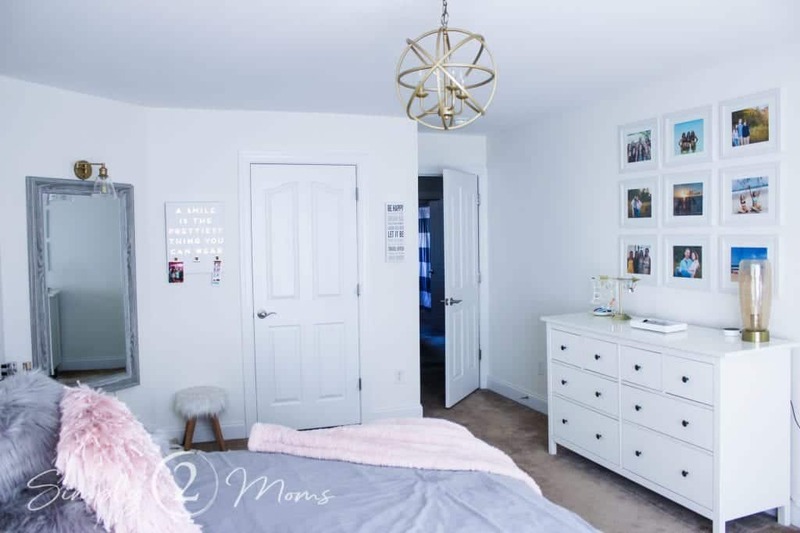 The gallery wall above her dresser was a fun project to put together and personalizes her space. New light fixtures were painted to match her color scheme. 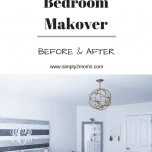 And the vanity area with the distressed gray full-length wall mirror was the last project we did to finally finish her teen girl bedroom makeover…for now. Because I think kids rooms are always evolving as they grow and change. Even as I’m writing this post, my daughter is planning another project for her room. And one last picture just because that orb light fixture is even prettier when it’s on. My daughter just loves it and now she loves it even more after my husband added a dimmer for the chandelier last weekend. I mean seriously…how fun is it to dim the lights while lounging on your comfy bed binging Netflix…right!? 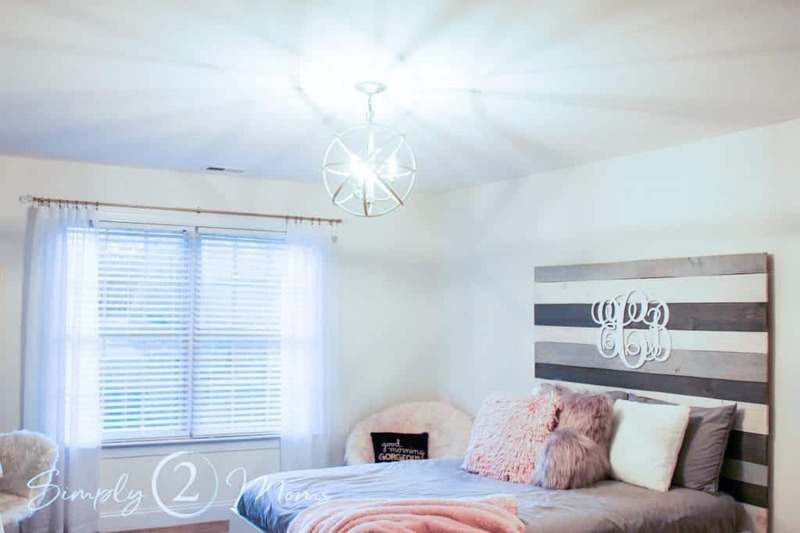 What do you need for this teen girl bedroom makeover? 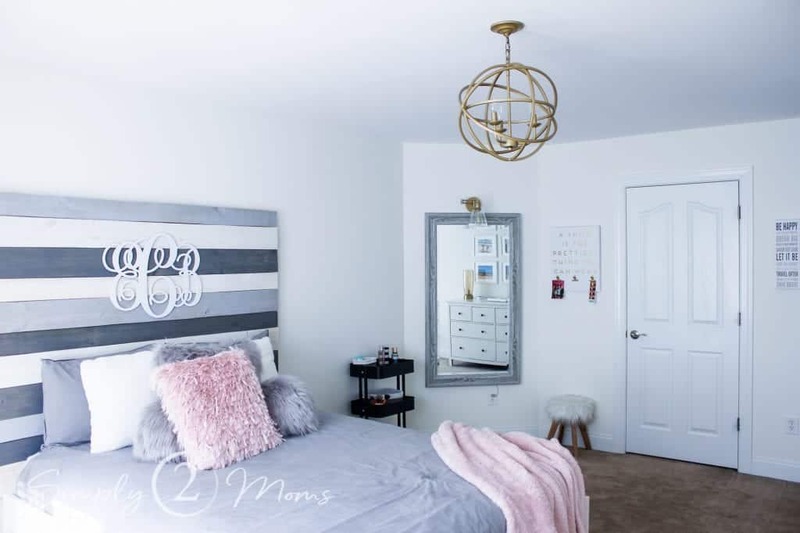 I’ve included a list of items I used to decorate my daughter’s room. 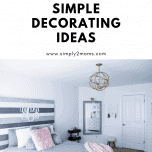 You can find additional links for the items needed for the gallery wall, light fixture, and vanity area projects in each of those post links above.